The genomic biomarker research aims to identify molecular correlates that can reflect disease status and can be clinically useful by relying on the retrospective analysis of well-annotated tissue samples. To do this, diseased and normal tissue can be stored as formalin-fixed paraffin-embedded (FFPE) blocks in clinical archives. FFPE allows the extraction of high quality nucleic acids and can be widely used for genomic biomarker discovery studies. A big part of biomarker research in tissue is centered on cancer. Just like any other types of disease, cancer tissue usually shows regional heterogeneity in cell preservation and cell type. Review microscope slide and outline region of interest, cut out a section large enough to cover the region on the slide and place the film on the slide. Remove the film, transfer it, and orient it on the film by flipping or rotating it so the region of interest can be observed. Make shallow indentations on the outline of the region of interest and load 1ml of bleach, 70% ethanol, and water into 2.0ml microcentrifuge tubes. Slide the punch up and down several times into the tube containing bleach. Repeat with 70% ethanol, then water to ensure bleach is removed. Press the punch into the tissue, release the core in a low binding 2ml tube and store cores at -20⁰C for long term or 4⁰C for short-term. Clean the punch and continue with other samples. Add 1ml xylene to the core, vortex rigorously for 10 seconds, heat for 3 minutes at 50⁰C. Centrifuge for 2 minutes at room temperature. Place tube on ice for 5 minutes. Remove paraffin that is accumulated around meniscus using pipette tip and repeat xylene treatment. Add 1ml ethanol and vortex rigorously for 10 seconds. Centrifuge for 2 minutes, discard ethanol, repeat. Resuspend cores in 700μl of ethanol before homogenization. Grind cores into fine tissue particles using motorized tissue homogenizer. Fill 15ml tubes with 10ml bleach, RNase neutralizing solution, 70% ethanol. Clean homogenizer probe and allow to dry before homogenizing next sample. After homogenization, bring sample volume to 1ml, add 300μl ethanol, centrifuge for 15 mins, aspirate ethanol, and air-dry pellet for 15-20 minutes before proceeding with RNA extraction. Resuspend pellet in 150μl Proteinase K digestion buffer. Add 10μl of temperature stable proteinase K.
Incubate content at 56⁰C for 15 minutes. Incubate on ice for 3 minutes. Cool completely then centrifuge for 15 minutes. Transfer supernatant to a new 1.5ml for RNA purification. Incubate RNA with supernatant at 80⁰C for 15 minutes. Centrifuge tube to collect drops from inside the lid. Add 320μl buffer, mix by pipetting. Add 720μl ethanol and vortex. Transfer 600μl of sample to RNA spin column in 2ml collection tube. Centrifuge for 15 seconds, discard flow through, reuse collection tube. Transfer remaining sample and centrifuge for 15 seconds, discard flow through. Add 350μl buffer to spin column and centrifuge, discard flow through. Mix 10μl DNase I stock solution and 70μl buffer RDD, and incubate. Add 500μl buffer FRN to spin column, centrifuge. 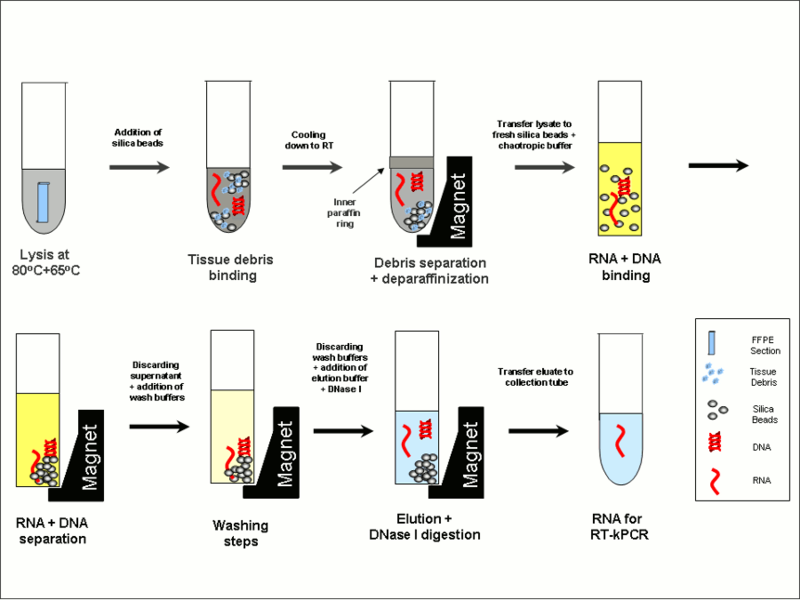 To enhance recovery of small RNAs, place in new 2ml collection tube, centrifuge. Add 500μl buffer RPE, centrifuge, discard flow through. Place spin column in new 2ml tube, open the lid, centrifuge for 5 minutes, discard flow through. Place spin column in new 1.5ml collection, add 20μl of RNase free water, incubate for 1 minute, centrifuge for 1 minute, store at -80⁰C. Resuspend pellet by adding 45μl of proteinase K buffer and 400μg of high potency Proteinase K.
Incubate at 56⁰C for 24 hours. Allow the sample to cool, add 4μl RNase A, incubate for 2 minutes. Add 200μl buffer AL, mix by vortexing. Add 200μl of ethanol, mix by vortexing. Transfer sample to spin column, place in 2ml tube and centrifuge. Discard flow through, place spin column in new 2ml tube. Add 700μl buffer AW1, centrifuge for 15 seconds, discard flow through. Add 700μl buffer AW2, centrifuge, discard flow through. Add 700μl of ethanol to spin column, centrifuge, discard flow though. Place spin column in 1.5ml tube, add 25μl o heated nuclease-free water at 50⁰C. Incubate for 10 minutes, centrifuge for 1 minute, add 25μl nuclease free water, incubate for 1 minute at room temperature. Centrifuge for 1 minute, harvest flow through that contains genomic DNA and store it at -20⁰C. Optimization of Proteinase Digestion includes using a more potent proteinase K solution that resulted in higher DNA yield. This can be done by extending the digestion from 2 hours to 24 hours. Accurate coring is critical for successful extraction of DNA and RNA from regions of interest. Modifications made to a commercially available protocol such as the one above makes it suitable for the co-extraction of RNA and DNA. This protocol should enable its users to carry our targeted gene0based analyses of large tissue collections. Most importantly, it enables focused sampling of specific regions of interest in FFPE, less hands-on time, and higher yields that are enough for most downstream applications. Fix tissues using 10% formalin for 24-48 hours at room temperature. Make sure tissues are fully covered. Trim fixed tissues to fit into embedding cassettes. Trim blocks as necessary, cut at 3-10μm. Place paraffin ribbon in water bath at 40-45⁰C. Air dry sections for 30 minutes. Bake in oven 45-50⁰C overnight without going higher than 50⁰C. Deparaffinize sections in 2-3 changes of xylene for approximately 10 minutes each. For sections thicker than 25μm, use three changes of xylene. Hydrate it in 2 changes of 100% ethanol, 3 minutes each. Then proceed to 95% and 80% ethanol for 1 minute each. Finally, rinse in distilled water.